Sunday’s Premier League action kicks off at Selhurst Park where Crystal Palace take on league leaders Manchester City. The hosts go into the game in seventeenth place and are outside of the relegation on goal difference following Saturday’s results. Their defeat to Arsenal on Thursday evening ended an eight game unbeaten run – the best the Eagles have ever achieved in the history of the division. Yohan Cabaye suffered a knock against the Gunners and could miss out here while Joel Ward is also doubtful with a groin problem. Christian Benteke is widely available at 11.0 (10/1) to get the first goal of the game, ahead of 13.0 (12/1) chance Wilfried Zaha. The home win is as highly priced as the 12.0 (11/1) on offer from a variety of firms, with the visitors odds on favourites at 1.28 (2/7). The draw can be backed at 6.5 (11/2) from a number of companies. Manchester City made it eighteen league wins in a row after edging past Newcastle United on Wednesday evening and another victory here would see Pep Guardiola match his best ever run, which he achieved during his time as Barcelona manager. Three points here would see the table toppers pass the sixty point mark and move sixteen points clear of reigning champions Chelsea, who moved up to second yesterday after thumping Stoke City 5-0 while Manchester United only managed a goalless draw against Southampton. The Citizens have problems in defence with captain Vincent Kompany, Fabian Delph and John Stones all doubts while Phil Foden is definitely out with an ankle injury. 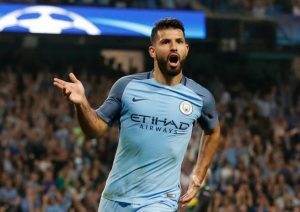 Sergio Aguero is favourite to open the scoring at 3.8 (14/5) with Unibet with top scorer Raheem Sterling a 5.2 (21/5) shot with the same firm. Manchester City have won their last seven meetings with Crystal Palace, with the most recent of those triumphs coming in the shape of a 5-0 rout at the Etihad Stadium back in September. You can back the champions elect to score four or more this time around at 3.5 (5/2) with Sky Bet while the away win to nil can be found at 2.3 (13/10).